Invasions of alien species have caused several problems in the past, as they can lead to economic losses, may pose a risk to human and animal health, threaten local biodiversity and change ecosystem functions and services. 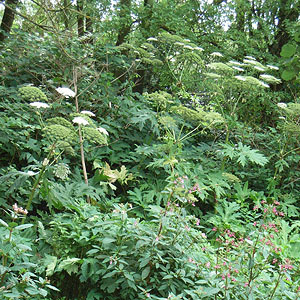 In Germany about 500 non-native plant species are known to occur at least sporadically in the wild; the state office of Bavaria (LfU) considers 62 of them to be problematic weeds (black list of invasive plant species). It seems probable that the present situation will intensify with global change due to several factors, such as changed climate and disturbance regimes, land use change or changed nutrient and water availability. With climate change, several factors are expected to decrease native species fitness, while at the same time favouring invasive species. On one hand, species distributions are expected to track climatic niches which will lead to new invasions, on the other hand, invasions into existing communities may increase due to ecosystem destabilisation caused by species loss, decreased abundance of key species, asynchrony, or changed disturbance. The work addresses the question how competition with native species influences the dispersal and establishment of invasive species and in particular how biotic interactions will alter with a changing climate. In addition to competition experiments in controlled conditions and in the field, the impact of competition and climate on recent distribution limits will be studied using existing data and field surveys along altitudinal gradients.